From the outside, some people’s marriages look amazing! They always seem happy and their relationship looks easy to maintain. But absolutely no marriage is perfect! The fact is, it takes intentional consistency to keep your relationship strong. Perhaps you wonder what defines a happy marriage. (Read this article here to answer that question). 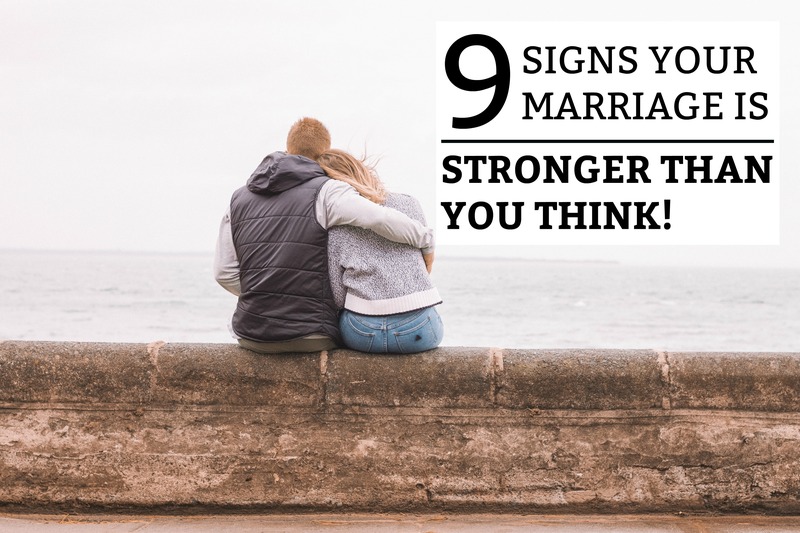 To answer that question, below are 9 signs that your marriage might be stronger than you think! Many, many couples make the HUGE mistake of viewing their relationship as 50/50 when it comes to decision making. What is good for you does NOT mean it is good for both of you and your relationship. It doesn’t matter what the decision is! Getting a new credit card, making a purchase over an agreed-upon amount, going on a trip, taking a promotion, moving jobs, etc. Big or small, it is always a wise choice to run your ideas past your spouse before making a final decision. Your life decisions directly impact each other. Talking through life decisions is a great indicator that your marriage is built on a strong, mutually-respectful foundation. Your spouse is your partner and teammate! To keep your marriage strong and connected, you need to have a common goal and both work towards it! It’s OK for one of you to take the lead during certain circumstances – because both of you have strengths and weaknesses. You’re there to balance out the relationship and make each other stronger! If one of you believes that they are always “the boss” and can make all the decisions without the consent of the other, trouble is headed your way. This almost always leads to resentment and blame – because “the boss” will inevitably make a bad decision that will impact the family unit negatively. If he/she made that decision without consulting their spouse, a major disagreement will undoubtedly be the result. As a team, you need to focus on valuing each other’s opinions, so you can continue to thrive and grow as the PARTNERS – the way you were meant to be. If you see your spouse as a teammate, your marriage will feel much more fulfilling and loving. You BOTH should feel incredibly blessed to have each other. With this mentality, your marriage will stay strong! If you find yourself always thinking negatively about your marriage, sit down and write down a list of things you’re thankful for. You know that annoying habit that your spouse has? Imagine if they weren’t there anymore – bad habits and all. Life would be so lonely without them! If necessary, go to a relationship therapist. Therapy is nothing to be ashamed of! You both need to feel “lucky” to have a good relationship! It’s worth the work and the investment. Although humor can’t hold a relationship together, it can certainly help to get you through the tough times! Do you just “get each other’s sense of humor”? Do you love laughing with your spouse and just kidding around! If you both find enjoyment in the little things and the boring times (which are inevitable), you’ll live a happy life together. Laughter is good for your health! If you haven’t laughed together in a while, invest in it! Think back to what you both used to love to do. Invest in the fun times again. Your marriage will be stronger for it! Trust is the cornerstone to every successful relationship. Without it, a relationship will die. If you trust your spouse, your relationship is already stronger than most! What areas do you trust them in? What areas do you not trust them in? In point #2, we discussed the “teammate mentality”. To have a successful team, you absolutely must trust each other. Think about it. If one of you had to make a life-changing decision without consulting the other, would you explicitly trust each other to make the right decision? Life choices happen every single day. Do you think of each other before making them? Or do you make a decision first – and then think of the consequences later? If you do not trust each other, you need to sit down and have a long, deep conversation. Tell each other your doubts, suspicions, and insecurities. Make sure that you are both on the same page when it comes to trust issues. Often, it only takes a conversation to uncover trust issues. This is the only way to learn how to meet each other’s expectations and build relationship trust! Wait, what?! Arguments aren’t healthy?! NO! Heated arguments are rarely healthy for any relationship. Addressing and working through problems in a respectful manner is KEY to a happy marriage. If you and your spouse already do this, BRAVO! Every couple argues in a different way. Perhaps your spouse is loud and dramatic. Or perhaps they get very quiet and unresponsive when they are upset at you. Or maybe they are direct, stern, and unrelenting. You have to realize that your spouse is very different from you and they need a chance to have their opinion heard in a respectful manner – even if you think they are completely wrong! Perhaps you feel the need to talk it out immediately! You and your spouse will have to learn whether this method works for you or not. However, the key is to not disregard it for too long. Talk it through, work at it, and find some common ground. Yes! This is actually one of the most helpful things to know – no matter how long you have been married! Have you ever heard of “The 5 Love Languages”? To sum it up, we all feel loved in different ways. The 5 most essential ways are through physical touch, quality time, acts of service, receiving gifts, and words of affirmation. Most of us love all of these things! But there is usually one or two of these that mean more to you than the others. Do you absolutely love holding hands and snuggling up together? Do you love it when your partner does some household chores? Or would you prefer them to bring you home a lovely gift? Or perhaps you love it when they tell you how much you mean to them. See how each of these “love languages” may mean more to one person than another? Find out what both you and your partner’s love language is and start fulfilling it! You never know, maybe you have been focusing on giving your partner what YOU NEED, not what they need. Find out each of your love languages here. Have you ever heard the saying “Once a cheater, always a cheater”. Although people can change, there is definitely a greater chance of cheating if it has been done before. Statistics have shown that people who have cheated before are 350% more likely to cheat again? Second chances are wonderful and they can give people an opportunity to show they have changed their ways! However, the likelihood that they will never cheat again are not too good. If nether of you have cheated, your marriage already has an advantage! Keep up the good work and invest in each other! …when things go good and when things go bad – you always want to talk to your babe first! They’re the person you always want to laugh with or cry with. In other words, they are your best friend in the whole, wide world! Marriages are always stronger when you see your spouse as your deepest friend and confidant.